The 5th Reinforcements of the 22nd Battalion sustained heavy casualties during their time in France and Belgium. In this section the forty-one men that fell and would never return to their families will be remembered on the centenary of their death. 27 year-old labourer Henry Sparks from Kensington enlisted into the AIF on the 12th July 1915. Pte Sparks sailed on the RMS Osterley with the 5th/22nd on 29th September 1915 for Egypt. While training in the desert Pte Sparks along with the rest of the 5th/22nd was Taken on Strength into the 22nd Battalion on the 8th January 1916, before sailing on the Llandovery Castle on 19th March as the AIF joined the BEF in France. Pte Sparks served with the 22nd Battalion in the ‘nursery’ sector of Bois Grenier before moving south as part of I Anzac Corps for the great Somme offensive. The 22nd Battalion moved forward into Pozieres on the 27th July 1916 where they endured a terrific bombardment from the German guns until they were relieved on 30th July. Following the heavy losses in the Battalion Pte Sparks was promoted to Lance Corporal. The relief was short lived and on 4th August the 22nd Battalion commenced its passage through the heavily shelled trenches of Pozieres to the jumping off trench for an attack on the German trenches known as OG1 and OG2. C Company successfully pushed through to OG2 and began to dig in, in preparation for the counter-attack which came at dawn. It was during the fighting on 5th August 1916 that L-Cpl Sparks was wounded in action with a gunshot wound to the left shoulder and abdomen and admitted to 44th Casualty Clearing Station. L-Cpl Sparks was evacuated to England where he was admitted to Beaufort War Hospital in Bristol and after six weeks discharged to the AIF Depots at Perham Down in Wiltshire. L-Cpl Sparks re-joined the Battalion on 18th December 1916 near Amiens before returning to the forward area in the Ginchy Sector of the Somme for the bitterly cold winter of 1916/17. As a result of the harsh conditions L-Cpl Sparks was admitted to hospital on the 1st February 1917 with frost bite and a septic toe, travelling back to England and the 1st Southern Hospital, Birmingham. Discharged back to AIF Depots in April 1917, L-Cpl Sparks would re-join the Battalion in France on 9th July 1917 before heading to Belgium and the Third Battle of Ypres. L-Cpl Sparks was with the 22nd Battalion as they manned the front-line on the Westhoek Ridge prior to the Menin Road attack and suffered heavy casualties due to enemy shelling. As they were relieved L-Cpl Sparks was sent to hospital with boils, re-joining the Battalion five days after the Broodseinde attack in which the Battalion again suffered heavily. L-Cpl Sparks remained with the 22nd Battalion through the winter of 1917/18, the German Spring Offensive including the defence at Dernancourt and the victorious attack at Ville-sur-Ancre, and then the advance during the 100 Days Offensive. It was on the 3rd October 1918 as the 6th Brigade attacked the Beaurevoir Line, the final obstacle in the Hindenburg Line, that L-Cpl Sparks was killed in action. The 22nd Battalion was withdrawn from the front line for the very last time on the night of 5th/6th October. L-Cpl Sparks is buried alongside a number of his colleagues that died during the Battalion’s last fight at the Prospect Hill Cemetery, Gouy. 24 year-old farmer Archibald Smillie from Coburg enlisted into the AIF on the 10th July 1915 and sailed with the 5th/22nd on the RMS Osterley on 29th September 1915 for Egypt. While training in the desert 2381 Pte Smillie along with the rest of the 5th/22nd was Taken on Strength into the 22nd Battalion on the 8th January 1916, before sailing on 19th March on the Llandovery Castle as the AIF joined the BEF in France. Pte Smillie was transferred to the 22nd Battalion Headquarters staff and as there is no entry into his service record from his arrival in France to early 1918 it is presumed that Pte Smillie served with the 22nd Battalion throughout their time in France and Belgium in 1916 and 1917, including the battles at Pozieres, Bullecourt and Broodseinde. In February 1918 Pte Smillie was admitted to hospital following two weeks leave in England and it was during his recuperation at the 39th General Hospital Le Havre that he disobeyed an order leading to a Field General Court Martial. He was found guilty and sentenced to 12 months Imprisonment with Hard Labour, and sent to the 1st Military Prison Rouen on the 14th May 1918. Three weeks later Pte Smillie was released from prison and ordered to join the Battalion at the front. On the 17th July 1918 the 22nd Battalion endured one of their heaviest gas bombardments of the entire war and it was during this attack that Pte Smillie was Wounded in Action from the effects of the gas. He was admitted to the 40th Casualty Clearing Station where he died of his wounds on the 22nd July 1918. 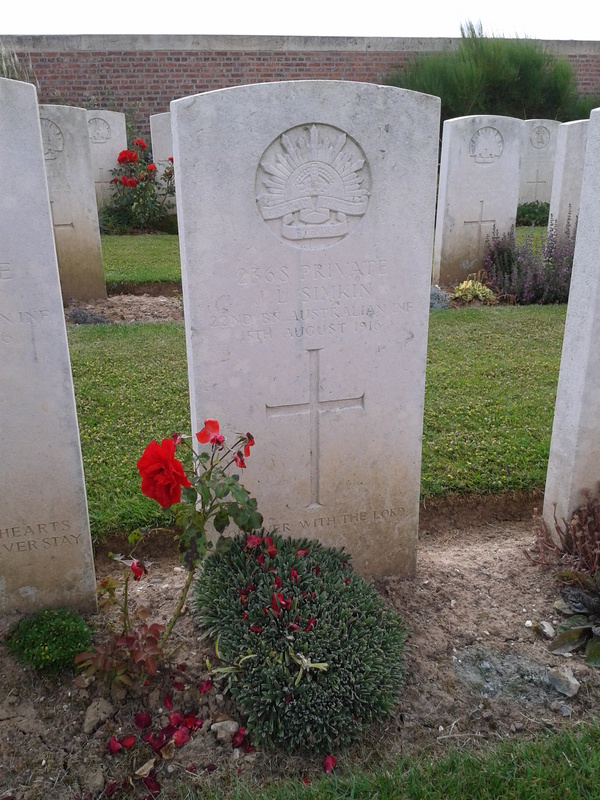 Pte Smillie is buried at the St. Riquier British Cemetery. 38 year-old married miner Edward Stuckey from Spotswood enlisted into the AIF on the 10th July 1915 and sailed with the 5th/22nd on the RMS Osterley on 29th September 1915 for Egypt. While training in the desert 2386 Pte Stuckey along with the rest of the 5th/22nd was Taken on Strength into the 22nd Battalion on the 8th January 1916, before sailing on 19th March on the Llandovery Castle as the AIF joined the BEF in France. Pte Stuckey served with the 22nd Battalion in the ‘nursery’ sector at Bois Grenier before moving south as part of I Anzac Corps for the great Somme offensive. The 22nd Battalion moved forward into Pozieres in the early hours of 27th July 1916 where Pte Stuckey, as part of C Company occupying the front line trenches endured a terrific bombardment from the German guns until they were relieved on 30th July. This relief was short lived and on 4th August the 22nd Battalion commenced its passage through the heavily shelled trenches of Pozieres to the jumping off trench for an attack on the German trenches known as OG1 and OG2. C Company successfully fought through to OG2 and began to dig in, in preparation for the counter-attack which came at dawn and successfully repelled. After a short tour in Belgium the Battalion returned to the Somme as the autumnal rains turned the trenches into a quagmire of mud and it was here in the Flers and Ginchy Sector of the Somme that Pte Stuckey became sick with myalgia and was admitted to hospital in England where he spent the rest of the winter. Pte Stuckey returned to the Battalion on 14th May 1917, just after the 22nd was involved in the heavy fighting at Bullecourt. Within a month Pte Stuckey was sick again which saw his return to England and after a bout of with various ailments returned to the Battalion, now in the La Basse Ville area on the French / Belgium border, on the 28th January 1918. Pte Stuckey moved south with the 22nd Battalion in early April to Dernancourt and to meet the German offensive on the Somme. On the 19th May 1918 the 22nd Battalion had the lead role in the 6th Brigade attack at Ville-sur-Ancre and it was during this successful operation that Pte Stuckey was killed in action. Pte Stuckey’s body was not recovered and is thus commemorated on the Villers-Bretonneux Memorial. 27 year-old labourer John Sharples from Melbourne enlisted into the AIF on the 7th July 1915 and sailed with the 5th/22nd on the RMS Osterley on 29th September 1915 for Egypt. While training in the desert Pte Sharples developed a hernia and on 10th July 1916 he was repatriated back to Australia on the HMT ‘Clan McGillivray’ where upon he underwent surgery. As 7367 Pte Sharples he returned to duty at the end of the year and set sail once again from Melbourne on 19th February 1917 on HMAT ‘Ballarat’. Arriving at Devonport on the 25th April Pte Sharples spent the summer in England training before being sent to France on the 11th September where he was Taken on Strength into the 23rd Battalion. Shortly after his arrival Pte Sharples was wounded in action in the 4th October 1917 attack at Broodseinde with a shell wound to the left arm. He was admitted to the 2nd Canadian Casualty Clearing Station before being invalided back to England for further treatment. Pte Sharples remained in England through the winter of 1917/18 at Hurdcott, Wareham and Longbridge Deverill camps before re-joining the 23rd Battalion on 20th February. In early April the 23rd Battalion as part of 6th Brigade and the 2nd Division began their march south to meet the German spring offensive now in full flow on the Somme. Alternating with the 22nd Battalion and the two other battalions of 6th Brigade in front of Dernancourt, the 23rd Battalion was in the forward outposts on 27th April 1918 when Pte Sharples was killed in action. Pte Sharples who is buried at Ribemont Communal Cemetery Extension had two brothers who also enlisted and served with the 5th Reinforcements 22nd Battalion, 2414 L-Cpl Robert Sharples and 2502 Cpl Reginald Sharples and who both survived the war. Reginald was also transferred to another battalion (57th Battalion) having also been repatriated back to Australia from Egypt, but in his case to serve a one year prison sentence following a Field General Court Martial for uncoupling a train carriage while in motion. 21 year-old grocer Ralph Wilson from Kyneton enlisted into the AIF on the 9th July 1915 and sailed with the 5th/22nd on the RMS Osterley on 29th September 1915 for Egypt. While training in the desert Pte Wilson was transferred to the 9th Battalion and then as part of the restructuring of the AIF into the 49th Battalion within the 13th Brigade, AIF 4th Division. Pte Wilson sailed for France on 5th June 1916 on the HMT ‘Arcadian’ arriving in Flanders as relief to the AIF 1st Division heading for the Somme. On 3rd September 1916 and during their second tour on the Pozieres Heights the 49th Battalion took part in an attack on Mouquet Farm where Pte Wilson was wounded in action with a gunshot wound to the leg. Pte Wilson was evacuated to England where he spent time being treated and recovering in hospital in Portsmouth before being released to No.1 Command Depot at Perham Down. In March 1917 Pte Wilson went Absent Without Leave and was awarded seven days close confinement and loss of three day’s pay. Pte Wilson re-joined his battalion on 6th August 1917 just before the start of the 3rd Ypres campaign which saw the 13th Brigade participate in the Battle of Polygon Wood. In mid-October Pte Wilson was admitted to hospital for a week with a septic knee, and then again in March 1918 with scabies, re-joining his unit on 25th March just as the 4th Division marched south to meet the enemy now threatening the city and railhead of Amiens within the great spring offensive. On 5th April the 49th Battalion were involved in one of the finest Australian counter-attacks of the war against the Germans that had just penetrated the line at Dernancourt. 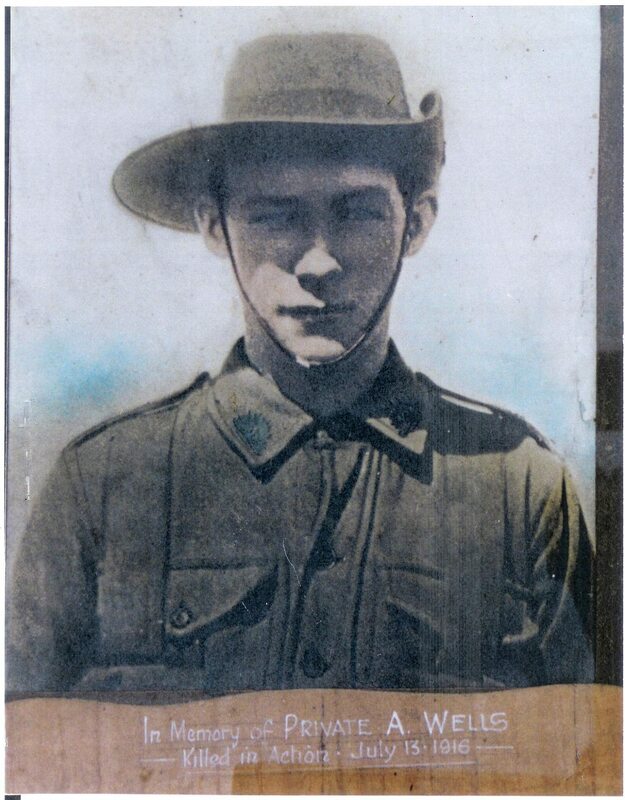 On the 26th April 1918 as the 13th Brigade participated in the recapture of Villers-Bretonneux, Pte Wilson was wounded in action for the second time with a gunshot wound to the forearm and abdomen and was taken to the 47th Casualty Clearing Station where he sadly died of his wounds the following day. Pte Wilson is buried at the Crouy British Cemetery at Crouy-sur-Somme. 38 year-old missioner Robert Yule from Richmond enlisted into the AIF on the 3rd July 1915 and sailed with the 5th/22nd on the RMS Osterley on 29th September 1915 for Egypt. While training in the desert Pte Yule along with the rest of the 5th/22nd was Taken on Strength into the 22nd Battalion on the 8th January 1916, before sailing on 19th March on the Llandovery Castle as the AIF joined the BEF in France. Pte Yule served with the 22nd Battalion in the ‘nursery’ sector at Bois Grenier before moving south as part of I Anzac Corps for the great Somme offensive. The 22nd Battalion moved forward into Pozieres in the early hours of 27th July 1916 where Pte Yule, as part of ‘D’ Company occupying the front line trenches, endured a terrific bombardment from the German guns until they were relieved on 30th July. This relief was short lived and on 4th August the 22nd Battalion commenced its passage through the heavily shelled trenches of Pozieres to the jumping off trench for an attack on the German trenches known as OG1 and OG2. ‘D’ Company successfully fought through to OG1 and began to dig in, in preparation for the counter-attack which came at dawn and successfully repelled. After the move from the Somme and during a short tour in Belgium Pte Yule was sent to hospital with deafness where he was treated until re-joining the 22nd Battalion on Christmas Day 1916, now back in France. Here in the Flers and Ginchy Sector of the Somme the Battalion remained through the bitterly cold months of January and February 1917 before pursuing the German Army in the vicinity of Warlencourt and Bapaume as they withdrew to the Hindenburg Line. On 3rd May 1917 the 22nd Battalion was tasked with attacking the heavily fortified German line at Bullecourt and sustained heavy casualties during this the Second Battle of Bullecourt. Following the battle the 22nd Battalion spent the summer of 1917 refitting and training for the forthcoming 3rd Ypres campaign in Belgium in which the 22nd Battalion made a series of tours to the front line where they endured heavy casualties. Pte Yule having so far gone through the war without a wounding was granted two weeks leave at the end of September, thereby missing the successful but costly attack by the 22nd Battalion at Broodseinde on the 4th October 1917, returning to the Battalion two days after the attack. The winter of 1917/1918 was split between digging in and preparing for the expected German spring offensive around the Warneton sector, and training and refitting near to the French coast at Boulogne. In April 1918 and with the German Spring Offensive now in full swing Pte Yule and the 22nd Battalion returned to the Somme to halt the enemy threatening Amiens and it was at Dernancourt on 14th April 1918 that Pte Yule’s luck ran out and he was killed in action. Pte Yule who is buried just outside of Amiens at the St. Pierre Cemetery, had two brothers in the Medical Corps and Artillery that both survived the war. 25 year-old carpenter Charles Robbins from Mooroopna enlisted into the AIF on the 5th July 1915 and sailed with the 5th/22nd on the RMS Osterley on 29th September 1915 for Egypt with the rank of Acting Sergeant. While training in the desert 2357 Pte Robbins along with the rest of the 5th/22nd was Taken on Strength into the 22nd Battalion on the 8th January 1916, before sailing on 19th March on the Llandovery Castle as the AIF joined the BEF in France. Pte Robbins served with the 22nd Battalion in the ‘nursery’ sector at Bois Grenier before moving south as part of I Anzac Corps for the great Somme offensive. The 22nd Battalion moved forward into Pozieres in the early hours of 27th July 1916 where the promoted L-Cpl Robbins, as part of C Company occupying the front line trenches endured a terrific bombardment from the German guns until they were relieved on 30th July. This relief was short lived and on 4th August the 22nd Battalion commenced its passage through the heavily shelled trenches of Pozieres to the jumping off trench for an attack on the German trenches known as OG1 and OG2. C Company successfully fought through to OG2 and began to dig in, in preparation for the counter-attack which came at dawn and successfully repelled. Following their relief L-Cpl Robbins had two quick promotions to Corporal and the Sergeant together with a brief spell in hospital for an abscess. After a short tour in Belgium the Battalion returned to the Somme as the autumnal rains turned the trenches into a quagmire of mud. Here in the Flers and Ginchy Sector of the Somme the battalion remained through the bitterly cold months of January and February 1917 before pursuing the German Army in the vicinity of Warlencourt and Bapaume as they withdrew to the Hindenburg Line. It was during this pursuit that Sgt Robbins was wounded in action on 8th March with gunshot wounds to the cheek, hand and neck which resulted in evacuation to the 3rd London General Hospital in Wandsworth. Following discharge from hospital and re-joining the 22nd Battalion at the end of July, Sgt Robbins was sent to the cadet battalion in August to begin his officer training. Sgt Robbins was appointed 2nd Lieutenant on the 19th December 1917 and was Taken on Strength back into the battalion on 12th January 1918 while the 22nd was taking front line rotation at La Basse Ville near Warneton. A welcome month-long break for the battalion close to Boulogne and the coast was followed by a return to the front line at La Basse Ville and it was during a Minenwerfer bombardment on the 9th March 1918 that 2nd Lieut. Robbins was hit by shrapnel and killed in action, and later buried at the Berks Cemetery Extension, Ploegsteert. 2nd Lieut. Robbins enlisted in the 5th/22nd with his younger brother 2488 Pte Garnet Robbins, MM, who was also killed in action during the fighting at Pozieres two years earlier. 26 year-old hardware assistant John Scott from Essendon enlisted into the AIF on the 12th July 1915 and sailed with the 5th/22nd on the RMS Osterley on 29th September 1915 for Egypt. While training in the desert Pte Scott along with the rest of the 5th/22nd was Taken on Strength into the 22nd Battalion on the 8th January 1916, before sailing on 19th March on the Llandovery Castle as the AIF joined the BEF in France. Pte Scott served with the 22nd Battalion in the ‘nursery’ sector at Bois Grenier before moving south as part of I Anzac Corps for the great Somme offensive. The 22nd Battalion moved forward into Pozieres in the early hours of 27th July 1916 where Pte Scott, as part of ‘C’ Company occupying the front line trenches, endured a terrific bombardment from the German guns until they were relieved on 30th July. This relief was short lived and on 4th August the 22nd Battalion commenced its passage through the heavily shelled trenches of Pozieres to the jumping off trench for an attack on the German trenches known as OG1 and OG2. ‘C’ Company successfully fought through to OG2 and began to dig in, in preparation for the counter-attack which came at dawn and successfully repelled. After a short tour in Belgium the Battalion returned to the Somme as the autumnal rains turned the trenches into a quagmire of mud. Here in the Flers and Ginchy Sector of the Somme the battalion remained through the bitterly cold months of January and February 1917 before pursuing the German Army in the vicinity of Warlencourt and Bapaume as they withdrew to the Hindenburg Line. On 3rd May 1917 the 22nd Battalion was tasked with attacking the heavily fortified German line at Bullecourt and sustained heavy casualties during the Second Battle of Bullecourt. Following the battle Pte Scott was promoted to Lance Corporal, and then he with the 22nd Battalion spent the summer of 1917 refitting and training for the forthcoming 3rd Ypres campaign in Belgium. L-Cpl Scott was a Lewis Gunner and it was during the Battalion’s flanking support on the Broodseinde Ridge of the Poelcappelle attack on the 9th October 1917 that L-Cpl Scott was killed in action by a shell. 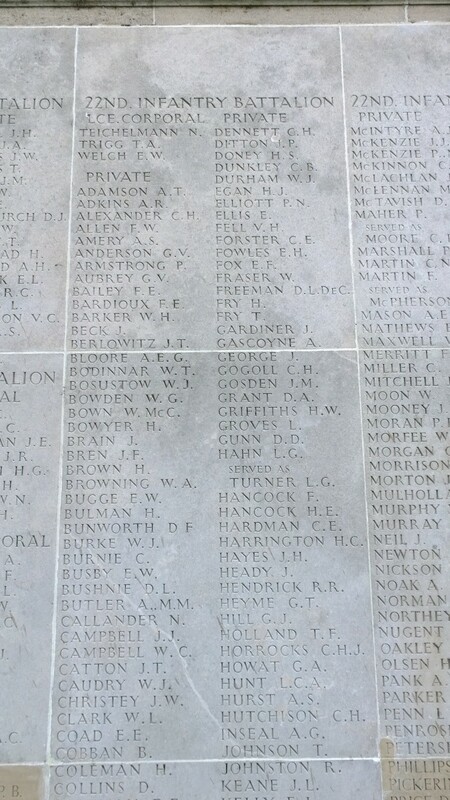 L-Cpl Scott is buried in the Tyne Cot Cemetery near to where he fell. 21 year-old Labourer Claude Parry from North Richmond enlisted into the AIF on the 12th July 1915 and although initially assigned to the 10th Reinforcements, 6th Battalion, sailed on the RMS Osterley with the 5th/22nd on 29th September 1915 for Egypt. While training in the desert Pte Parry along with the rest of the 5th/22nd was Taken on Strength into the 22nd Battalion on the 8th January 1916, before sailing on 19th March on the Llandovery Castle as the AIF joined the BEF in France. Pte Parry served with the 22nd Battalion in the ‘nursery’ sector at Bois Grenier before moving south as part of I Anzac Corps for the great Somme offensive. The 22nd Battalion moved forward into Pozieres in the early hours of 27th July 1916 where Pte Parry, as part of ‘D’ Company occupying the front line trenches, endured a terrific bombardment from the German guns until they were relieved on 30th July. This relief was short lived and on 4th August the 22nd Battalion commenced its passage through the heavily shelled trenches of Pozieres to the jumping off trench for an attack on the German trenches known as OG1 and OG2. ‘D’ Company successfully fought through to OG1 and began to dig in, in preparation for the counter-attack which came at dawn and successfully repelled. After a short tour in Belgium the Battalion returned to the Somme as the autumnal rains turned the trenches into a quagmire of mud. Here in the Flers and Ginchy Sector of the Somme the Battalion remained through the bitterly cold months of January and February 1917 before pursuing the German Army in the vicinity of Warlencourt and Bapaume as they withdrew to the Hindenburg Line. On 3rd May 1917 the 22nd Battalion was tasked with attacking the heavily fortified German line at Bullecourt and sustained heavy casualties during this the Second Battle of Bullecourt. Following the battle Pte Parry, by this stage one of the few men remaining in the 5th/22nd not to have been wounded or sick, was promoted to Lance Corporal, and then he and the 22nd Battalion spent the summer of 1917 refitting and training for the forthcoming 3rd Ypres campaign in Belgium. L-Cpl Parry was one of the Battalion Scouts and on several occasions did conspicuous work in that capacity. It was during the Battalion’s advance at Broodseinde on the 4th October 1917 that L-Cpl Parry’s luck ran out and was shot and killed in action. L-Cpl Parry, well liked throughout his company and generally a ‘Good Sport’, was never found and is thus commemorated on the Menin Gate Memorial, Ypres. 26 year-old farmer Emanuel Symons from Mildura enlisted into the AIF on the 15th July 1915 and sailed on the RMS Osterley with the 5th/22nd on 29th September 1915 for Egypt. While training in the desert Pte Symons along with the rest of the 5th/22nd was Taken on Strength into the 22nd Battalion on the 8th January 1916, before sailing on 19th March on the Llandovery Castle as the AIF joined the BEF in France. Pte Symons served with the 22nd Battalion in the ‘nursery’ sector at Bois Grenier before moving south as part of I Anzac Corps for the great Somme offensive. The 22nd Battalion moved forward into Pozieres in the early hours of 27th July 1916 where Pte Symons, as part of ‘D’ Company occupying the front line trenches, endured a terrific bombardment from the German guns until they were relieved on 30th July. This relief was short lived and on 4th August the 22nd Battalion commenced its passage through the heavily shelled trenches of Pozieres to the jumping off trench for an attack on the German trenches known as OG1 and OG2. ‘D’ Company successfully fought through to OG1 and began to dig in, in preparation for the counter-attack during which Pte Symons was wounded in action with gunshot wounds to the shoulder and back. After being admitted to the 11th General Hospital, Camiers he was transferred to England and the 5th Northern General Hospital, Leicester. In early October he was discharged to the AIF Depots before re-joining the 22nd Battalion on 9th January 1917 in the Ginchy Sector of the Somme. Here the Battalion remained through the bitterly cold months of January and February 1917 before pursuing the German Army in the vicinity of Warlencourt and Bapaume as they withdrew to the Hindenburg Line. On 3rd May 1917 the 22nd Battalion was tasked with attacking the heavily fortified German line at Bullecourt and sustained heavy casualties during this the Second Battle of Bullecourt. Following the battle the 22nd Battalion spent the summer of 1917 refitting and training for the forthcoming 3rd Ypres campaign in Belgium. It was during the Battalion’s attack at Broodseinde on the 4th October 1917 that Pte Symons was killed in action. 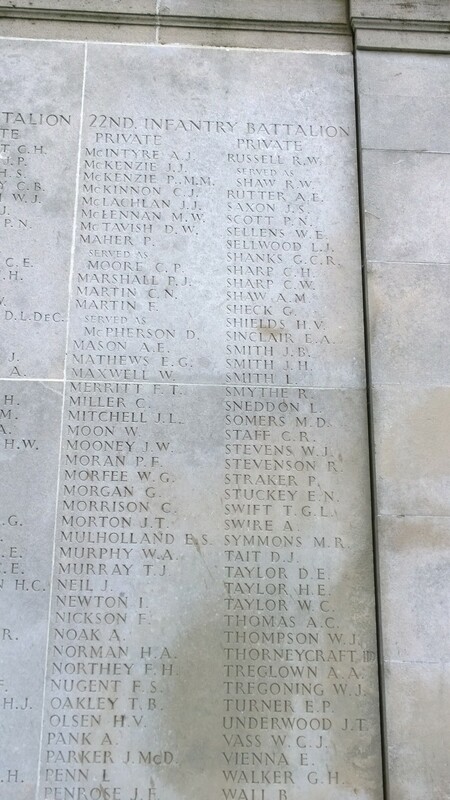 Pte Symons was never found and is thus commemorated on the Menin Gate Memorial, Ypres. 27 year-old pastoralist David Evans from Wangaratta enlisted into the AIF on the 8th February 1915 and sailed for Egypt on the RMS Osterley on 29th September 1915 as the senior officer of the 5th/22nd. While training in the desert 2nd Lieut. Evans was admitted to hospital with mumps and upon discharge was transferred and Taken on Strength to the 8th Battalion as part of the AIF restructuring that took place as the AIF prepared to join the BEF in France, sailing on the ‘Megantic’ on the 26th March 1916. 2nd Lieut. Evans served with the 8th Battalion in the ‘nursery’ sector at Bois Grenier before moving south as part of I Anzac Corps for the great Somme offensive. During the AIF 1st Division attack at Pozieres 2nd Lieut. Evans was wounded by a shell, but remained at duty and as a platoon commander of D Company led the successful capture of their objectives under heavy machine gun fire for which he was Mentioned in Dispatches and promoted to Lieutenant. After a short tour in Belgium – where he was again Mentioned in Dispatches for leading a successful raiding party – and attendance at training school, Lieut. Evans returned to the Somme in the Flers and Ginchy Sector of the Somme where the 8th Battalion remained through the bitterly cold months of January and February 1917 before pursuing the German Army in the vicinity of Warlencourt and Bapaume as they withdrew to the Hindenburg Line. On 24th April 1917 he was promoted to Captain and took command of the 8th Battalion’s A Company. On 8th May 1917 the 8th Battalion took over the recently captured OG2 line at Bullecourt and where Capt. Evans was awarded the Military Cross for his conduct during one of the fiercest hand to hand bombing exchanges of the war. Following the battle the 8th Battalion spent the summer of 1917 refitting and training for the forthcoming 3rd Ypres campaign in Belgium. It was during the attack at the Menin Road on 20th September 1917 that Capt. Evans was wounded by a shell but later died of his wounds at the 10th Casualty Clearing Station, and is buried at the Lijssenthoek Military Cemetery. Three weeks later, Capt.Evans brother 2399 Pte Francis Evans of the 51st Battalion, would also be killed in action in the attack towards Passchendaele. Capt. Evans was and extremely popular man and leader as summed up in a letter from Capt. Hurrey – “Gerry was a grand man… I cannot speak highly enough of Gerry’s courage and behaviour…. The test of a man is to know what the men think of him and Gerry was, to use the boy’s own phrase betokening the hall-mark ‘A Dinkum Bloke.’ Believe me, that is the highest tribute a man can be paid.” Read more on Capt. Evans in the Family Stories section. Commemorated on the Villers-Bretonneux Memorial. 25 year-old Storeman Thomas Reynolds from Hotham Hill enlisted into the AIF on the 12th July 1915 and sailed on the RMS Osterley with the 5th/22nd on 29th September 1915 for Egypt. While training in the desert Pte Reynolds along with the rest of the 5th/22nd was Taken on Strength into the 22nd Battalion on the 8th January 1916, before sailing on 19th March 1916 on the Llandovery Castle as the AIF joined the BEF in France. Pte Reynolds served with the 22nd Battalion in the ‘nursery’ sector of Bois Grenier before moving south as part of I Anzac Corps for the great Somme offensive. The 22nd Battalion moved forward into Pozieres in the early hours of 27th July 1916 with Pte Reynolds as part of C Company, occupying the front line trenches. Here the Battalion endured a terrific bombardment from the German guns until they were relieved on 30th July and during which time Pte Reynolds was evacuated with shell shock, but re-joined the Battalion shortly afterwards on 12th August. In October Pte Reynolds was admitted to hospital first with scabies then Pyrexia for which he was transferred to hospital in England. Pte Reynolds re-joined the 22nd Battalion on 20th January 1917 in the Ginchy Sector, just as the winter frosts bit hard and before pursuing the German Army in the vicinity of Warlencourt and Bapaume as they withdrew to the Hindenburg Line. The 22nd Battalion was tasked with attacking the heavily fortified German line at Bullecourt and it was here that Pte Reynolds was sadly killed in action on 3rd May 1917. Pte Reynolds was never found and is thus commemorated on the Villers-Bretonneux Memorial. 23 year-old Boilermaker Percy Scott from Footscray enlisted into the AIF on the 9th July 1915 and sailed on the RMS Osterley with the 5th/22nd on 29th September 1915 for Egypt. While training in the desert Pte Scott along with the rest of the 5th/22nd was Taken on Strength into the 22nd Battalion on the 8th January 1916, but stayed with Divisional Base Duties in Egypt before sailing on 2nd August 1916 on the HMT ‘Franconia’ to France. Shortly afterwards Pte Scott went Absent Without Leave and by the end of August went sick with pneumonia and was transferred to hospital in England. Pte Scott re-joined the 22nd Battalion on 9th December 1916 in the notoriously muddy Flers Sector, and remained there just as the winter frosts bit hard until pursuing the German Army in the vicinity of Warlencourt and Bapaume, as they withdrew to the Hindenburg Line towards the end of February 1917. The 22nd Battalion was tasked with attacking the heavily fortified German line at Bullecourt and it was here that Pte Scott was sadly killed in action on 3rd May 1917. Pte Scott was never found and is thus commemorated on the Villers-Bretonneux Memorial. 29 year-old Labourer Thomas Trigg from Northcote enlisted into the AIF on the 12th July 1915 and sailed on the RMS Osterley with the 5th/22nd on 29th September 1915 for Egypt. While training in the desert Pte Trigg along with the rest of the 5th/22nd was Taken on Strength into the 22nd Battalion on the 8th January 1916, before sailing on 19th March 1916 on the Llandovery Castle as the AIF joined the BEF in France. Pte Trigg served with the 22nd Battalion in the ‘nursery’ sector of Bois Grenier before moving south as part of I Anzac Corps for the great Somme. The 22nd Battalion moved forward into Pozieres in the early hours of 27th July 1916 where Pte Trigg, as part of D Company occupying the front line trenches, endured a terrific bombardment from the German guns until they were relieved on 30th July. This relief was short lived and on 4th August the 22nd Battalion commenced its passage through the heavily shelled trenches of Pozieres to the jumping off trench for an attack on the German trenches known as OG1 and OG2. D Company successfully fought through to OG1 and began to dig in, in preparation for the counter-attack which came at dawn and successfully repelled. After a short tour in Belgium the Battalion returned to the Somme as the autumnal rains turned the trenches into a quagmire of mud. Like many at the time Pte Trigg contracted Trench Feet and on 12th November 1916 was transferred to hospital in Rouen before returning to the Battalion just before the end of the year. Here in the Ginchy Sector of the Somme the Battalion remained through the bitterly cold months of January and February 1917. On the 17th February 1917 Pte Trigg was appointed Lance Corporal, shortly before pursuing the German Army in the vicinity of Warlencourt and Bapaume as they withdrew to the Hindenburg Line. The 22nd Battalion was tasked with attacking the heavily fortified German line at Bullecourt and it was here that Pte Trigg was sadly killed in action on 3rd May 1917. 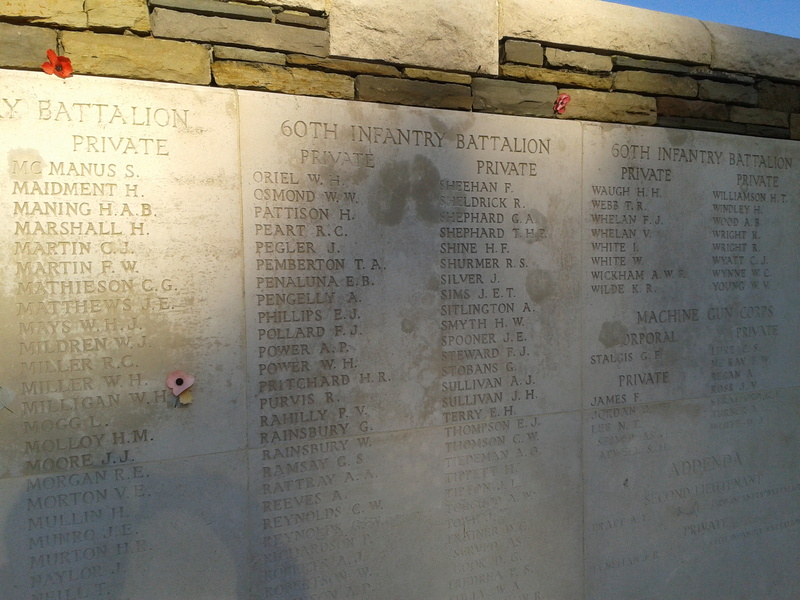 Pte Trigg was never found and is thus commemorated on the Villers-Bretonneux Memorial. 22 year-old Printer Neville Teichelmann from Abbotsford enlisted into the AIF on the 13th July 1915 and sailed on the RMS Osterley with the 5th/22nd on 29th September 1915 for Egypt. While training in the desert Pte Teichelmann along with the rest of the 5th/22nd was Taken on Strength into the 22nd Battalion on the 8th January 1916, before sailing on 19th March 1916 on the Llandovery Castle as the AIF joined the BEF in France. Pte Teichelmann served with the 22nd Battalion in the ‘nursery’ sector of Bois Grenier before moving south as part of I Anzac Corps for the great Somme offensive. The 22nd Battalion moved forward into Pozieres in the early hours of 27th July 1916 with Pte Teichelmann, as part of a Lewis Gun section in D Company, occupying the front line trenches. Here the Battalion endured a terrific bombardment from the German guns and Pte Teichelmann was evacuated with shell shock, but re-joined the Battalion shortly afterwards on 11th August. After a short tour in Belgium the Battalion returned to the Somme as the autumnal rains turned the trenches into a quagmire of mud. Here the Battalion remained in the Ginchy Sector of the Somme through the bitterly cold months of January and February 1917 and where Pte Teichelmann went Absent Without Leave for four days in the weeks leading up to Christmas. On the 17th February 1917 Pte Teichelmann was appointed Lance Corporal, shortly before pursuing the German Army in the vicinity of Warlencourt and Bapaume as they withdrew to the Hindenburg Line. The 22nd Battalion was tasked with attacking the heavily fortified German line at Bullecourt and it was here that Pte Teichelmann was sadly killed in action on 3rd May 1917. Pte Teichelmann was never found and is thus commemorated on the Villers-Bretonneux Memorial. for treatment in England and spent six weeks in hospital in Epsom before being discharged to furlough. During his time at the Perham Down Camp preparing for his return to France, Pte Martin went Absent Without Leave on two occasions before returning to the Battalion, now back on the Somme in the Ginchy Sector, on 18th December. Here the Battalion remained through the bitterly cold months of January and February 1917 before pursuing the German Army in the vicinity of Warlencourt and Bapaume as they withdrew to the Hindenburg Line. The 22nd Battalion was tasked with attacking the heavily fortified German line at Bullecourt and it was here that Pte Martin was sadly killed in action on 3rd May 1917. Pte Martin was never found and is thus commemorated on the Villers-Bretonneux Memorial. 22 year-old driver John Siddell from South Northcote enlisted into the AIF on the 10th July 1915 and sailed on the RMS Osterley with the 5th/22nd on 29th September 1915 for Egypt. While training in the desert Pte Siddell along with the rest of the 5th/22nd was Taken on Strength into the 22nd Battalion on the 8th January 1916, and shortly after appointed Lance Corporal on 22nd February. On 19th March 1916 L-Cpl Siddell sailed on the Llandovery Castle as the AIF joined the BEF in France. L-Cpl Siddell served with the 22nd Battalion in the ‘nursery’ sector of Bois Grenier before moving south as part of I Anzac Corps for the great Somme offensive. The 22nd Battalion moved forward into Pozieres in the early hours of 27th July 1916 with L-Cpl Siddell, as part of D Company, occupying the front line trenches. Here the Battalion endured a terrific bombardment from the German guns until they were relieved on 30th July and it was during this period that L-Cpl Siddell was evacuated to England with shell shock. L-Cpl Siddell spent time at hospitals and convalescent camps in Kent and Sussex before being discharged for return to duty, re-joining the 22nd Battalion on 18th December. On 1st March 1917 L-Cpl Siddell was promoted to Corporal during the time the Battalion as part of I Anzac Corps was pursuing the Germans to the Hindenburg Line, and it was outside of Warlencourt that Cpl Siddell was killed in action on 16th March 1917. 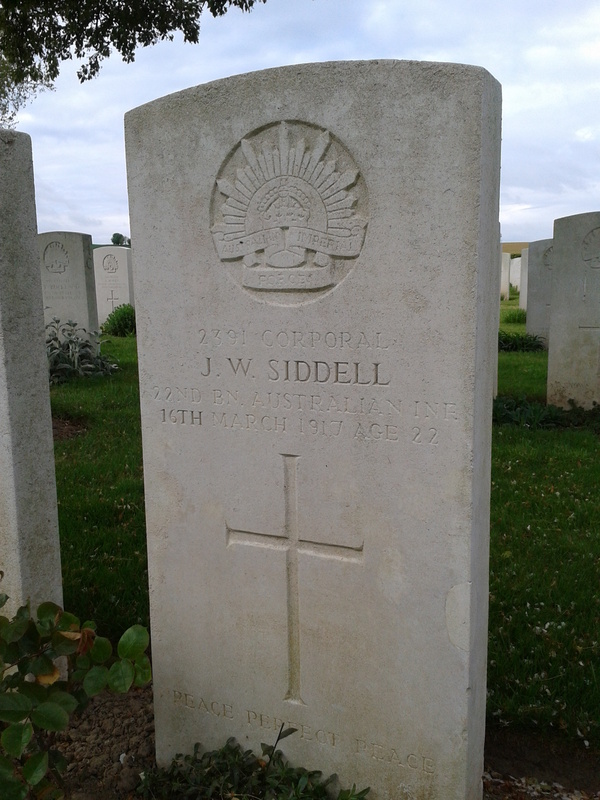 Cpl Siddell is buried at the nearby Warlencourt British Cemetery. 37 year-old labourer William Gibson from Richmond enlisted into the AIF on the 12th July 1915 and sailed on the RMS Osterley with the 5th/22nd on 29th September 1915 for Egypt. While training in the desert Pte Gibson along with the rest of the 5th/22nd was Taken on Strength into the 22nd Battalion on the 8th January 1916 before being transferred to the newly formed 2nd Pioneer Battalion on 12th March 1916. On 19th March 1916 Pte Gibson sailed on the Llandovery Castle as the AIF joined the BEF in France. Pte Gibson served with the 22nd Battalion in the ‘nursery’ sector of Bois Grenier, and as the Battalion began its move south as part of I Anzac Corps for the great Somme offensive, Pte Gibson was on the 14th July 1916, including Ptes Sloss, Saunders and Spicer of the 5th/22nd transferred to the newly formed 2nd Australian Tunnelling Company. The 2nd ATC was at this stage responsible for the tunnelling in the Neuville-Saint Vass/Vimy area in Northern France. On the 30th September 1916 Pte Gibson was transferred (along with Sloss and Spicer) to the 2nd Pioneer Battalion responsible for the construction of field fortifications including trenches and dugouts, military camps, bridges and roads. The 2nd Pioneers returned to the Somme with the AIF 2nd Division at the end of October and began the difficult task of digging new front line and communication trenches in the atrocious muddy conditions of the Flers Sector, all the time under the threat of being observed and shelled. 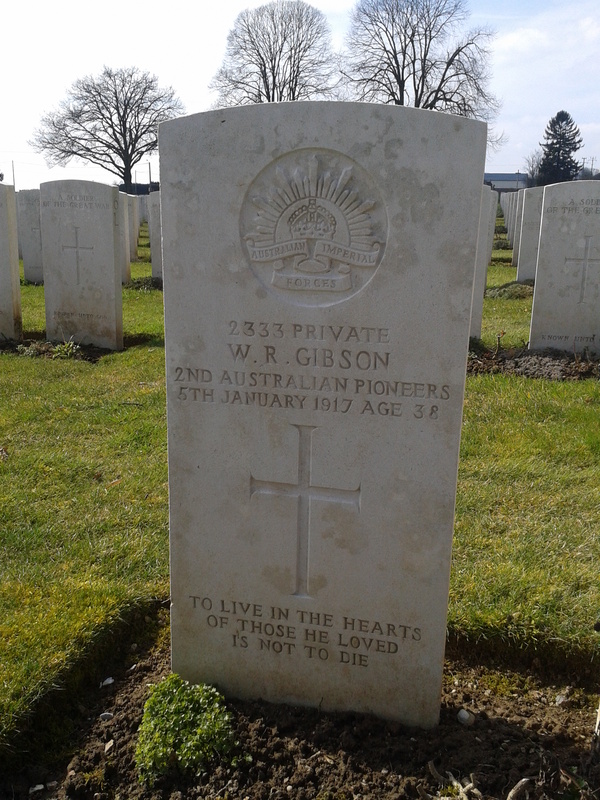 Pte Gibson was killed in action on 5th January 1917 and was buried at Delville Wood Cemetery, Longueval. 18 year-old labourer Arthur Quinn from Richmond enlisted into the AIF on the 12th July 1915 and sailed on the RMS Osterley with the 5th/22nd on 29th September 1915 for Egypt. While training in the desert Pte Quinn along with the rest of the 5th/22nd was Taken on Strength into the 22nd Battalion on the 8th January 1916. On 19th March 1916 Pte Quinn sailed on the Llandovery Castle as the AIF joined the BEF in France. Pte Quinn served with the 22nd Battalion in the ‘nursery’ sector of Bois Grenier before moving south as part of I Anzac Corps for the great Somme offensive. The 22nd Battalion moved forward into Pozieres in the early hours of 27th July 1916 with Pte Quinn, as part of C Company, occupying the front line trenches. Here the Battalion endured a terrific bombardment from the German guns until they were relieved on 30th July. This relief was short lived and on 4th August the 22nd Battalion commenced its passage through the heavily shelled trenches of Pozieres to the jumping off trench for an attack on the German trenches known as OG1 and OG2. C Company successfully pushed through to OG2 and began to dig in, in preparation for the counter-attack which came at dawn and was repelled. After the heavy fighting and losses at Pozieres, Pte Quinn was promoted to L-Cpl. The 22nd Battalion moved to Belgium and the quiet Ypres Sector in mid-September before heading south again to the Somme, beginning front line duty in the mud filled trenches of the Flers Sector on 2nd November. It was here that L-Cpl Quinn was wounded in action by a shell on the 15th November causing a compound fracture to his right thigh, and sadly died of his wounds a day later at the 36th Casualty Clearing Station, Heilly. L-Cpl Quinn is buried at the nearby Heilly Station Cemetery, Mericout-L’Abbe. and the Battalion moved north to the quieter Ypres Sector and then at the end of October headed south again and began the difficult task of digging new front line and communication trenches in the atrocious muddy conditions of the Flers Sector, all the time under the threat of being observed and shelled. 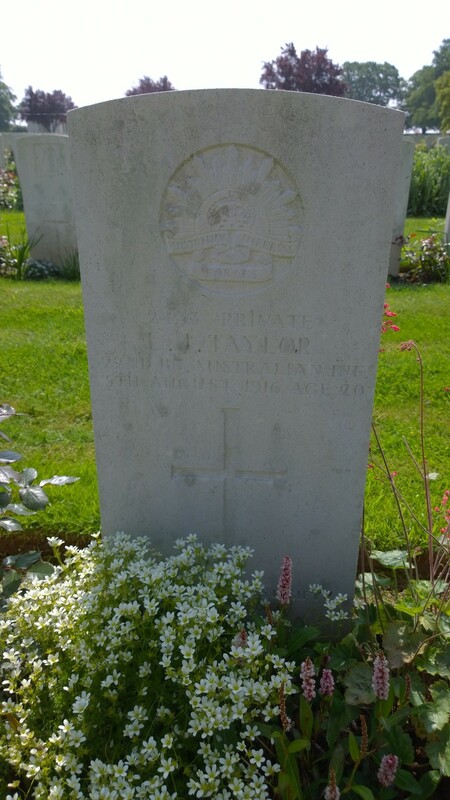 It was during the digging of a communication trench during an attack by the 5th & 7th Brigades at The Maze on the 14th November 1916 that Pte Myers was wounded in action with a shell wound to the chest, and he sadly died of his wounds two days later at the 1st Anzac Medical Dressing Station. Pte Myers served with his younger brother Robert, who survived the war, both in the 22nd and then the 2nd Pioneers. Pte Myers was buried at the nearby Dartmoor Cemetery at Becordel-Becourt. 38 year-old labourer Harry Sloss from Port Melbourne enlisted into the AIF on the 16th July 1915 and sailed on the RMS Osterley with the 5th/22nd on 29th September 1915 for Egypt. While training in the desert Pte Sloss along with the rest of the 5th/22nd was Taken on Strength into the 22nd Battalion on the 8th January 1916. On 19th March 1916 Pte Sloss sailed on the Llandovery Castle as the AIF joined the BEF in France. Pte Sloss served with the 22nd Battalion in the ‘nursery’ sector of Bois Grenier, and as the Battalion began its move south as part of I Anzac Corps for the great Somme offensive, Pte Sloss was on the 14th July 1916, including Ptes Gibson, Saunders and Spicer of the 5th/22nd transferred to the newly formed 2nd Australian Tunnelling Company. The 2nd ATC was at this stage responsible for the tunnelling in the Neuville-Saint Vass/Vimy area in Northern France. On the 30th September 1916 Pte Sloss was transferred (along with Gibson and Spicer) to the 2nd Pioneer Battalion responsible for the construction of field fortifications including trenches and dugouts, military camps, bridges and roads. The 2nd Pioneers returned to the Somme with the AIF 2nd Division at the end of October and began the difficult task of digging new front line and communication trenches in the atrocious muddy conditions of the Flers Sector, all the time under the threat of being observed and shelled. It was during the digging of a communication trench during an attack by the 5th & 7th Brigades at The Maze on the 14th November 1916 that Pte Sloss was killed in action. Pte Sloss was never found and is thus commemorated on the Villers-Bretonneux Memorial. 29 year-old furniture salesman Albert Bishop from Parkville enlisted into the AIF on the 8th July 1915 and sailed on the RMS Osterley with the 5th/22nd on 29th September 1915 for Egypt. While training in the desert Pte Bishop along with the rest of the 5th/22nd was Taken on Strength into the 22nd Battalion on the 8th January 1916. On 19th March 1916 Pte Bishop sailed on the Llandovery Castle as the AIF joined the BEF in France. Pte Bishop served with the 22nd Battalion in the ‘nursery’ sector of Bois Grenier before moving south as part of I Anzac Corps for the great Somme offensive. The 22nd Battalion moved forward into Pozieres in the early hours of 27th July 1916 with Pte Bishop, as part of D Company, occupying the front line trenches. The Battalion endured a terrific bombardment from the German guns and it was here that Pte Bishop was wounded in the shoulder by a shell and evacuated to 44th Casualty Clearing Station, Puchevillers before being transferred to No.6 Convalescent Camp Etaples. Pte Bishop was discharged from Etaples and re-joined the Battalion on 28th August 1916 as it was being withdrawn from the Somme for a period of rest and reorganisation. The 22nd Battalion then moved to Belgium and the quiet Ypres Sector in mid-September before heading south again to the Somme, beginning front line duty in the mud filled trenches of the Flers Sector on 2nd November. 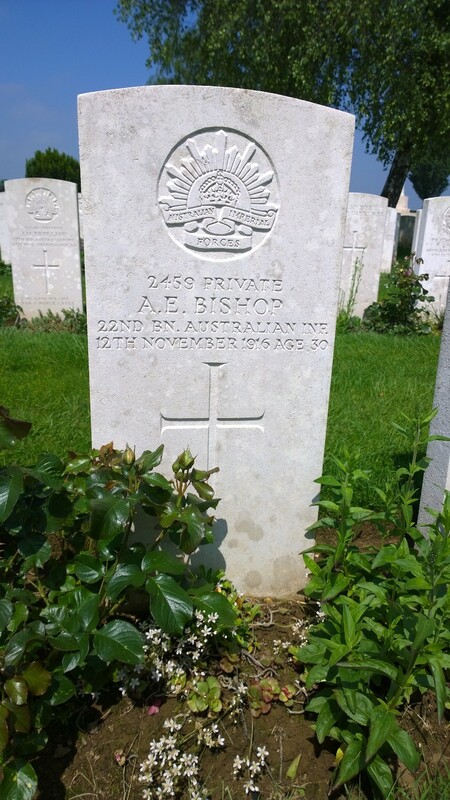 It was here that Pte Bishop was killed in action on 12th November 1916, and was buried in the nearby AIF Burial Ground. 26 year-old driver James Simkin from Kew enlisted into the AIF on the 12th July 1915 and sailed on the RMS Osterley with the 5th/22nd on 29th September 1915 for Egypt. While training in the desert Pte Simkin along with the rest of the 5th/22nd was Taken on Strength into the 22nd Battalion on the 8th January 1916. While in the Canal Zone Pte Simkin was charged with Conduct to the Prejudice of Good Military Order for leaving ranks without permission at Ferry Post for which he was awarded 48 hours Field Punishment Number 2. On 19th March 1916 Pte Simkin sailed on the Llandovery Castle as the AIF joined the BEF in France. Pte Simkin served with the 22nd Battalion in the ‘nursery’ sector of Bois Grenier before moving south as part of I Anzac Corps for the great Somme offensive. The 22nd Battalion moved forward into Pozieres in the early hours of 27th July 1916 with Pte Simkin, as part of C Company, occupying the front line trenches. Here the Battalion endured a terrific bombardment from the German guns until they were relieved on 30th July. During the fighting of 27th July – 4th August Pte Simkin was Mentioned in Dispatches ‘for distinguished and gallant services and devotion to duty during the hard fighting around Pozieres’. The relief was short lived and on 4th August the 22nd Battalion commenced its passage through the heavily shelled trenches of Pozieres to the jumping off trench for an attack on the German trenches known as OG1 and OG2. C Company successfully pushed through to OG2 and began to dig in, in preparation for the counter-attack which came at dawn. It was during the fighting on 4th August 1916 that Pte Simkin was wounded in action with a gunshot wound to the abdomen. He was taken to the 3rd Casualty Clearing Station at Puchevillers but sadly died eleven days later of his wounds and was buried at the nearby Puchevillers British Cemetery. Pte Simkin had a younger brother alongside him in the 5th/22nd, 2369 Pte E Simkin, who despite also being wounded at Pozieres survived the war. 19 year-old file cleaner Cyril Schwab from Camberwell enlisted into the AIF on the 9th July 1915. Pte Schwab sailed on the RMS Osterley with the 5th/22nd on 29th September 1915 for Egypt. While training in the desert Pte Schwab along with the rest of the 5th/22nd was Taken on Strength into the 22nd Battalion on the 8th January 1916. Pte Schwab was admitted to hospital in the Canal Zone with influenza in February, returning to the Battalion in early March before sailing on the Llandovery Castle on 19th March as the AIF joined the BEF in France. Pte Schwab served with the 22nd Battalion in the ‘nursery’ sector of Bois Grenier before moving south as part of I Anzac Corps for the great Somme offensive. The 22nd Battalion moved forward into Pozieres in the early hours of 27th July 1916 with Pte Schwab, as part of C Company, occupying the front line trenches. Here the Battalion endured a terrific bombardment from the German guns until they were relieved on 30th July. This relief was short lived and on 4th August the 22nd Battalion commenced its passage through the heavily shelled trenches of Pozieres to the jumping off trench for an attack on the German trenches known as OG1 and OG2. C Company successfully pushed through to OG2 and began to dig in, in preparation for the counter-attack which came at dawn. It was during the fighting on 5th August 1916 that Pte Schwab was wounded in action with gunshot wounds to the head and legs. He was taken to the 3rd Casualty Clearing Station at Puchevillers but sadly died four days later of his wounds and was buried at the nearby Puchevillers British Cemetery. Pte Schwab had an elder brother that survived the war, 1612 Pte E Schwab, MM, of the 5th Battalion. Born in Jerilderie, NSW, 45 year-old married wharf labourer John Quinn from North Fitzroy enlisted into the AIF on the 12th July 1915. Pte Quinn sailed on the RMS Osterley with the 5th/22nd on 29th September 1915 for Egypt. While training in the desert Pte Quinn along with the rest of the 5th/22nd was Taken on Strength into the 22nd Battalion on the 8th January 1916, before sailing on the Llandovery Castle on 19th March as the AIF joined the BEF in France. Pte Quinn served with the 22nd Battalion in the ‘nursery’ sector of Bois Grenier before moving south as part of I Anzac Corps for the great Somme offensive. The 22nd Battalion moved forward into Pozieres in the early hours of 27th July 1916 with Pte Quinn, as part of C Company, occupying the front line trenches. Here the Battalion endured a terrific bombardment from the German guns until they were relieved on 30th July. This relief was short lived and on 4th August the 22nd Battalion commenced its passage through the heavily shelled trenches of Pozieres to the jumping off trench for an attack on the German trenches known as OG1 and OG2. C Company successfully pushed through to OG2 and began to dig in, in preparation for the counter-attack which came at dawn. It was during the fighting on 5th August 1916 that Pte Quinn was reported missing in action. The Court of Inquiry of 26th November 1917 concluded that Pte Quinn was killed in action and is thus commemorated on the Villers-Bretonneux Memorial. 22 year-old labourer Leslie Sellwood from Prahran enlisted into the AIF on the 10th July 1915. Pte Sellwood sailed on the RMS Osterley with the 5th/22nd on 29th September 1915 for Egypt. While training in the desert Pte Sellwood along with the rest of the 5th/22nd was Taken on Strength into the 22nd Battalion on the 8th January 1916, before sailing on the Llandovery Castle on 19th March as the AIF joined the BEF in France. Pte Sellwood served with the 22nd Battalion in the ‘nursery’ sector of Bois Grenier before moving south as part of I Anzac Corps for the great Somme offensive. The 22nd Battalion moved forward into Pozieres in the early hours of 27th July 1916 with Pte Sellwood, as part of C Company, occupying the front line trenches. Here the Battalion endured a terrific bombardment from the German guns until they were relieved on 30th July. This relief was short lived and on 4th August the 22nd Battalion commenced its passage through the heavily shelled trenches of Pozieres to the jumping off trench for an attack on the German trenches known as OG1 and OG2. C Company successfully pushed through to OG2 and began to dig in, in preparation for the counter-attack which came at dawn. It was during the fighting on 5th August 1916 that Pte Sellwood was killed in action. According to the statement of Capt M Sutherland, 22nd Battalion Adjutant, ‘This man was killed by shell-fire on 5/8/16 between ‘Gibraltar’ and the Cemetery. His body was placed on the parapet, but so far as is known no proper burial took place’. Pte Sellwood was never found and is thus commemorated on the Villers-Bretonneux Memorial. 19 year-old tinsmith Louis Gilbert Hahn from South Melbourne gave his name and served as Gilbert Turner when he enlisted into the AIF on the 10th July 1915. Pte Turner sailed on the RMS Osterley with the 5th/22nd on 29th September 1915 for Egypt. Within days of his arrival in Egypt Pte Turner was admitted to Luna Hospital with diarrhoea where he would have become acquainted with the horrors of war seeing many wounded from Gallipoli. Pte Turner was discharged from hospital and continued training, being Taken on Strength into the 22nd Battalion with the rest of the 5th/22nd on the 8th January 1916, before sailing on the Llandovery Castle on 19th March as the AIF joined the BEF in France. Pte Turner served with the 22nd Battalion in the ‘nursery’ sector of Bois Grenier before moving south as part of I Anzac Corps for the great Somme offensive. The 22nd Battalion moved forward into Pozieres in the early hours of 27th July 1916 with Pte Turner, as part of C Company, occupying the front line trenches. Here the Battalion endured a terrific bombardment from the German guns until they were relieved on 30th July. This relief was short lived and on 4th August the 22nd Battalion commenced its passage through the heavily shelled trenches of Pozieres to the jumping off trench for an attack on the German trenches known as OG1 and OG2. C Company successfully pushed through to OG2 and began to dig in, in preparation for the counter-attack which came at dawn. It was during the fighting on 5th August 1916 that Pte Turner was at first reported wounded then missing in action. The Court of Inquiry of 11th August 1917 concluded that Pte Turner was killed in action and is thus commemorated on the Villers-Bretonneux Memorial. Pte Turner had a brother 2911 Pte RW Williams that served with the 2nd Battalion. Born in Cunnamulla, Queensland, 21 year-old farmer Arthur Wells from Healseville enlisted into the AIF on 16th July 1915 and sailed with the 5th/22nd on the RMS Osterley on 29th September 1915 for Egypt. While training in Egypt Pte Wells was admitted with mumps to hospital at Moascar in the Canal Zone, re-joining the 22nd Battalion just four days before they set sail on the Llandovery Castle on the 19th March 1916 to join the BEF in France. Pte Wells served with the 22nd Battalion in the nursery sector of Bois Grenier before moving south as part of I Anzac Corps for the great Somme offensive. The 22nd Battalion moved forward into Pozieres in the early hours of 27th July 1916 with Pte Wells, as part of D Company, occupying the front line trenches. During the night of 28th/29th July, D Company under Major Mackay supported the attack by the 7th Brigade and they reached the German wire in front of OG1 before having to withdraw. 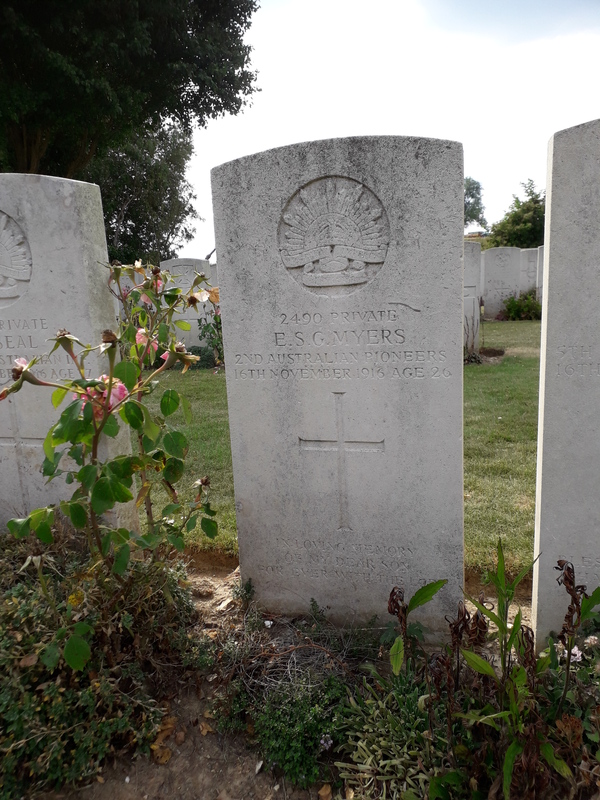 Pte Wells was wounded in action and admitted to 3rd Casualty Clearing Station at Puchevillers on 28th July with a gunshot wound to the head, and where he sadly died of his wounds two days later. 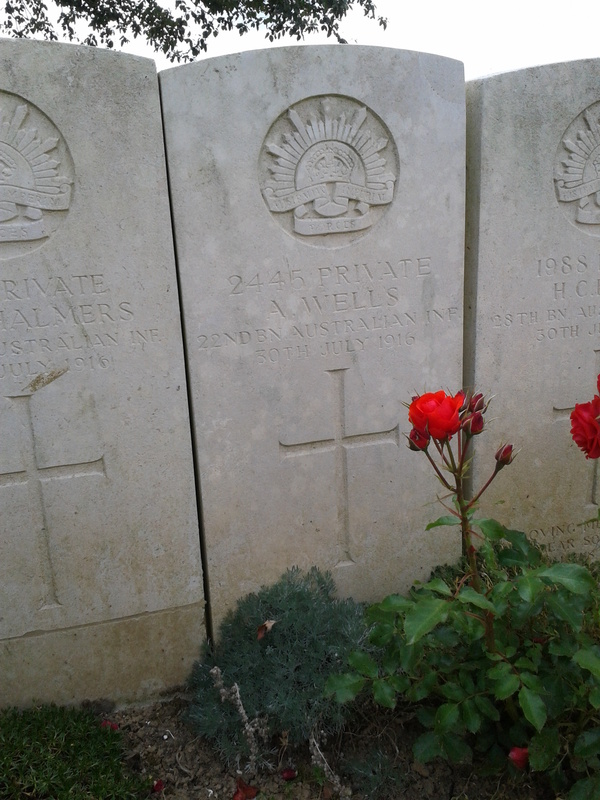 Pte Wells was buried in the nearby Puchevillers British Cemetery, officiated by the Reverand WM Woodburn. Born at Carisbrook 24 year-old coal-wheeler William Wardle from Wonthaggi enlisted into the AIF on 20th July 1915 and sailed with the 5th/22nd on the RMS Osterley on 29th September 1915 for Egypt. After a period of training and being Taken on Strength into the 22nd Battalion on 8th January 1916 Pte Wardle set sail on the Llandovery Castle on the 19th March 1916 to join the BEF in France. Pte Wardle served with the 22nd Battalion in the nursery sector of Bois Grenier before moving south as part of I Anzac Corps for the great Somme offensive. The 22nd Battalion moved forward into Pozieres in the early hours of 27th July 1916 with Pte Wardle, as part of D Company, occupying the front line trenches. During the night of 28th/29th July, D Company under Major Mackay supported the attack by the 7th Brigade and they reached the German wire in front of OG1 before having to withdraw. Pte Wardle was acting as a runner carrying messages between the front-line and battalion HQ and it was while delivering a message that Pte Wardle was hit by a shell and killed in action. 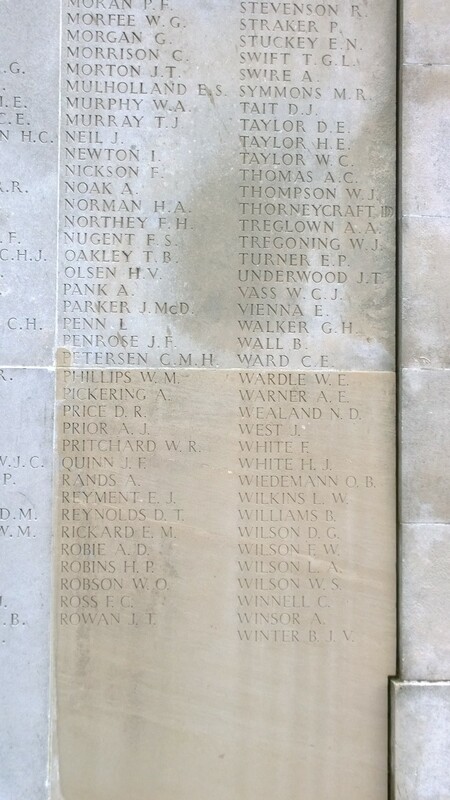 Pte Wardle was never found thus is commemorated on the Villers-Bretonneux Memorial. 20 year-old iron-moulder Garnet Robbins from Mooroopna enlisted into the AIF on 20th July 1915 and sailed with the 5th/22nd on the RMS Osterley on 29th September 1915 for Egypt. After a period of training and being Taken on Strength into the 22nd Battalion on 8th January 1916, Pte Robbins set sail from Alexandria on the Llandovery Castle on the 19th March 1916 to join the BEF in France. Pte Robbins served with the 22nd Battalion in the nursery sector of Bois Grenier and as part of the 6th Brigade took part on the night of 29th June in the largest raid by the AIF in this sector, and for which he was awarded the Military Medal for gallantry cutting the enemy wire while under fire and for helping to bring back the wounded as a stretcher-bearer under a barrage of shrapnel fire. On 7th July 1916 I Anzac Corps and the 22nd Battalion began to move south for the great Somme offensive, and during the relocation Pte Robbins went Absent without Leave from parade and was awarded 72 hours Field Punishment Number 2. 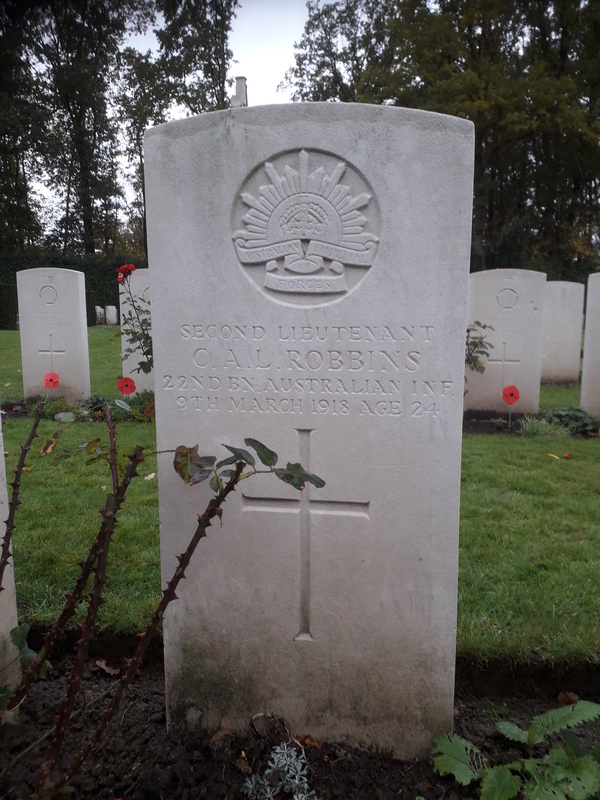 In the early hours of 27th July 1916 the 22nd Battalion moved forward into Pozieres and as part of C Company Pte Robbins occupied the front line trench. Sometime between 27th July and 4th August 1916 Pte Robbins was killed in action and was buried at the Pozieres British Cemetery, Ovillers-La Boisselle. Pte Robbins enlisted in the 5th/22nd with his elder brother Charles who was promoted through the ranks to 2nd Lieutenant. Sadly 2nd Lieut. Robbins was also killed in action on 9th March 1918 at Ploegsteert in Belgium. 35 year-old driver and married man John Rowan from Carlton enlisted into the AIF on 9th July 1915 but unlike his training colleagues of the 5th/22nd missed the sailing of the RMS Osterley from Fremantle on 5th October 1915, sailing a week later on the Themistocles for Egypt. After a period of training and being Taken on Strength into the 22nd Battalion on 8th January 1916, Pte Rowan had a short stay in hospital with a nose injury before he later set sail from Alexandria on the Scotian on 9th May 1916 to join the BEF in France. Pte Rowan re-joined and served with the 22nd Battalion in the nursery sector of Bois Grenier before moving south as part of I Anzac Corps for the great Somme offensive. While the Battalion was on the move Pte Rowan was charged with drunkenness and breaking from the ranks and awarded 28 days Field Punishment Number 2. 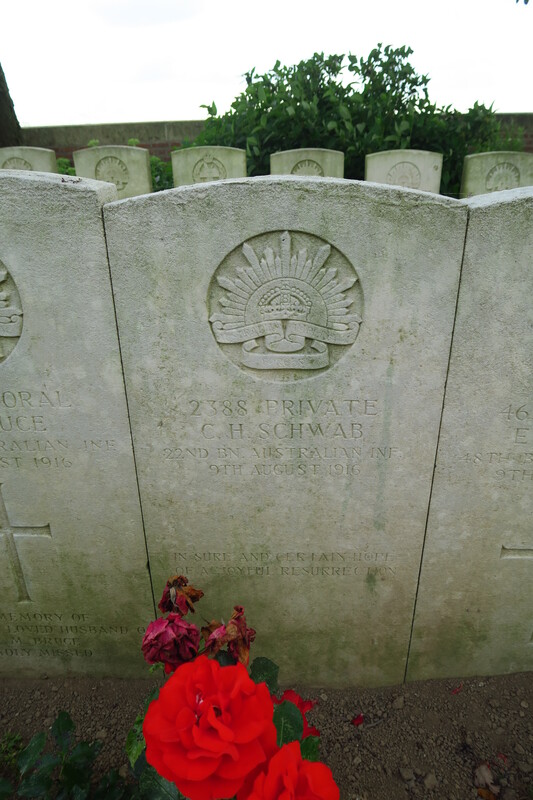 The 22nd Battalion moved forward into Pozieres in the early hours of 27th July 1916 and sometime between 27th July and 4th August 1916 Pte Rowan was killed in action. Pte Rowan was never found thus is commemorated on the Villers-Bretonneux Memorial. Born in North Fitzroy, Ellis Middleton the 31 year-old brass-finisher from Moonee Ponds working with South Melbourne firm John Danks, enlisted into the AIF on 10th July 1915 and sailed with the 5th/22nd on the RMS Osterley on 29th September 1915 for Egypt. After a period of training and being Taken on Strength into the 22nd Battalion on 8th January 1916, Pte Middleton set sail from Alexandria on the Llandovery Castle on the 19th March 1916 to join the BEF in France. Pte Middleton served with the 22nd Battalion in the nursery sector of Bois Grenier before moving south as part of I Anzac Corps for the great Somme offensive. 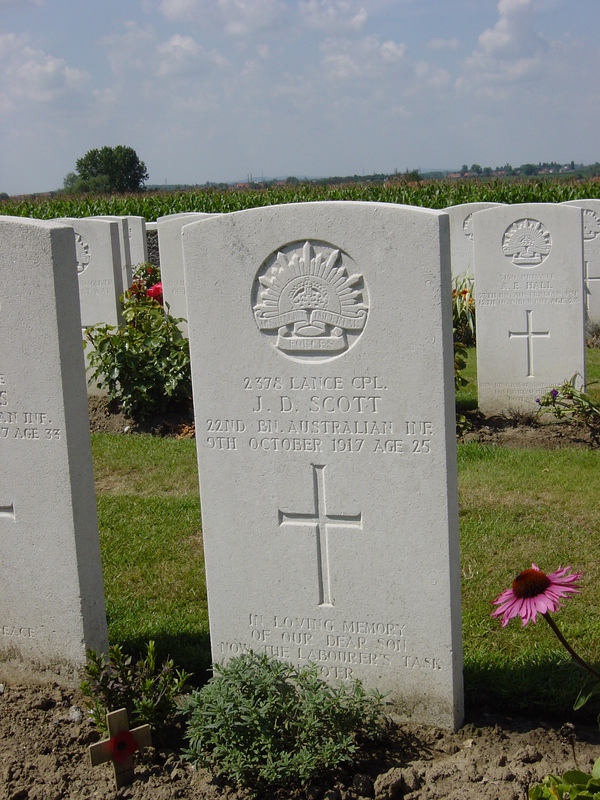 The 22nd Battalion moved forward into Pozieres in the early hours of 27th July 1916 and sometime between 27th July and 4th August 1916 Pte Middleton was killed in action. 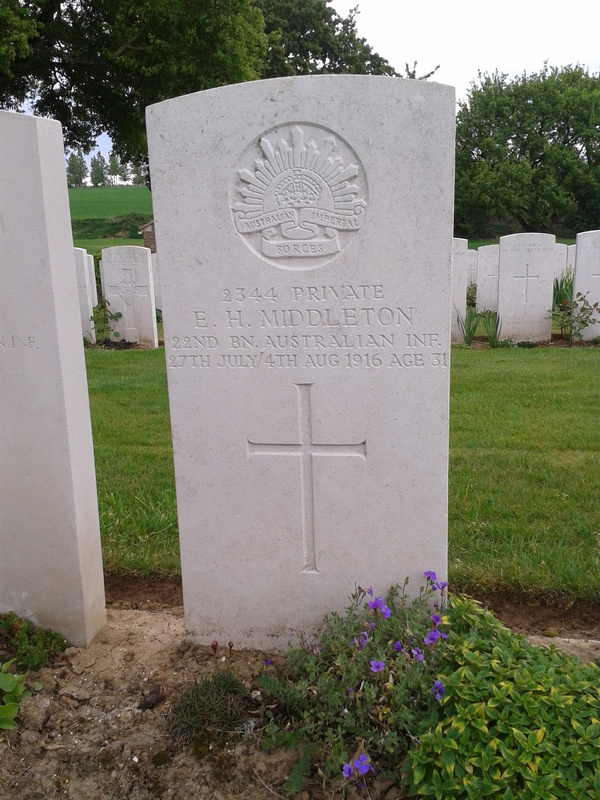 Pte Middleton was buried at the Gordon Dump Cemetery, Ovillers-La-Boiselle. Pte Middleton had a younger brother 53 Pte CH Middleton of the 7th Battalion who was wounded in action at Gallipoli and discharged in April 1916. 19 year-old labourer John Gardiner from Woolsthorpe enlisted into the AIF on 5th July 1915 and sailed with the 5th/22nd on the RMS Osterley on 29th September 1915 for Egypt. After a period of training and being Taken on Strength into the 22nd Battalion on 8th January 1916, Pte Gardiner set sail from Alexandria on the Llandovery Castle on the 19th March 1916 to join the BEF in France. Pte Gardiner served with the 22nd Battalion in the nursery sector of Bois Grenier before moving south as part of I Anzac Corps for the great Somme offensive. 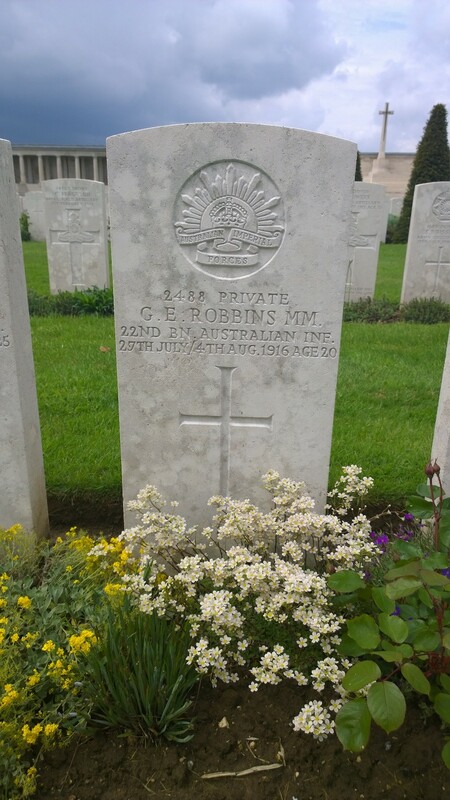 The 22nd Battalion moved forward into Pozieres in the early hours of 27th July 1916 and sometime between 27th July and 4th August 1916 Pte Gardiner was killed in action. Pte Gardiner was never found thus is commemorated on the Villers-Bretonneux Memorial. 21 year-old labourer Leslie Wilson from Hamilton enlisted into the AIF on 27th July 1915 and sailed with the 5th/22nd on the RMS Osterley on 29th September 1915 for Egypt. After a period of training and being Taken on Strength into the 22nd Battalion on 8th January 1916 Pte Wilson set sail on the Llandovery Castle on the 19th March 1916 to join the BEF in France. Pte Wilson served with the 22nd Battalion in the nursery sector of Bois Grenier before moving south as part of I Anzac Corps for the great Somme offensive. The 22nd Battalion moved forward into Pozieres in the early hours of 27th July 1916 with Pte Wilson, as part of D Company, occupying the front line trenches. During the night of 28th/29th July, D Company under Major Mackay supported the attack by the 7th Brigade and they reached the German wire in front of OG1 before having to withdraw. Pte Wilson was killed in action at some point in the Battalion’s stint in the front line. Pte Wilson was never found thus is commemorated on the Villers-Bretonneux Memorial. Buried at Becourt Military Cemetery, Becordel-Becourt. forward into Pozieres in the early hours of 27th July 1916 and as part of B Company Pte Saxon was in K Trench, the support trench, which was being heavily shelled causing many casualties. During this time Pte Saxon was wounded in the abdomen and chest. He was taken to 6th Field Ambulance but shortly afterwards died of his wounds. Pte Saxon was buried at Becourt Military Cemetery, Becordel-Becourt. 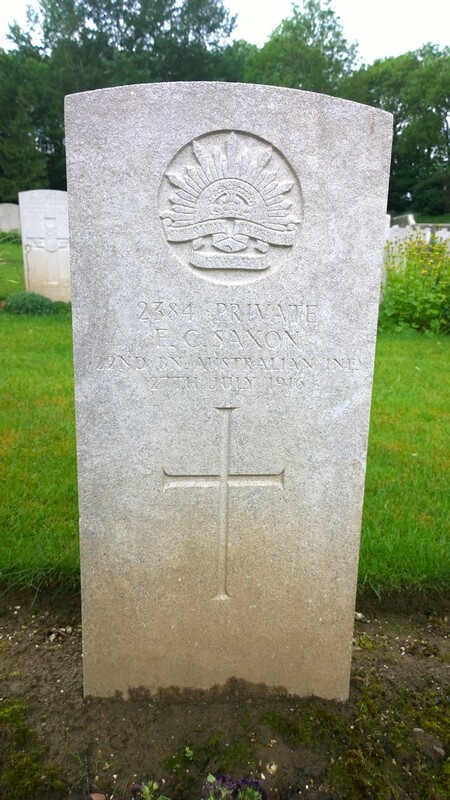 Francis Saxon was 2nd cousin to four Saxon brothers from Euroa that fought during WW1 including 17 year-old Joseph Saxon who enlisted as part of the 1st/22nd. Francis and Joe were tent-mates up until Francis’s death. Sadly 1564 Pte JS Saxon was also killed in action at Pozieres the following week. 28 year-old boot maker Richard Sheldrick from South Melbourne enlisted into the AIF on 16th July 1915 and sailed with the 5th/22nd on the RMS Osterley on 29th September 1915 for Egypt. While in Egypt he was hospitalised sick twice in February and April and as a result missed the sailing of the 22nd Battalion in March to join the BEF in France. Pte Sheldrick was therefore transferred to the newly formed 60th Battalion of the AIF 5th Division to continue his training. Pte Sheldrick embarked on the Kinfauns Castle on 18th June 1916, disembarking at Marseille on 29th June. Within three weeks of the Division’s arrival in France it would take part in the first major engagement by the Australians on the Western Front in the disastrous Somme diversionary attack at Fromelles, where in one single day the AIF suffered 5,533 casualties, the most in any one day period during its history. As part of the 60th Battalion, Pte Sheldrick was tasked with attacking the German strong-point known as the ‘Sugarloaf’ and like many of his mates including Pte Silver of the 5th/22nd was struck down in No-Man’s Land under the withering German machine guns and artillery fire. Of the 887 officers and men from the 60th Battalion that went into the fight, only one officer and 106 men answered the roll call. Pte Sheldrick was listed as Missing in Action and was not finally concluded as Killed in Action until the Court of Enquiry held on 4th August 1917. Pte Sheldrick was never found therefore is commemorated on the V.C. Corner Australian Memorial Wall close to where he fell and to the Fromelles Memorial Park. 24 year-old boot operative John Silver from Collingwood enlisted into the AIF on 12th July 1915 and sailed with the 5th/22nd on the RMS Osterley on 29th September 1915 for Egypt. While in Egypt he was hospitalised sick in December and only re-joined the 22nd Battalion five days before the battalion set sail in March to join the BEF in France. As a result Pte Silver was transferred to the newly formed 60th Battalion of the AIF 5th Division to continue his training. Pte Silver embarked on the Kinfauns Castle on 18th June 1916, disembarking at Marseille on 29th June. Within three weeks of the Division’s arrival in France it would take part in the first major engagement by the Australians on the Western Front in the disastrous Somme diversionary attack at Fromelles, where in one single day the AIF suffered 5,533 casualties, the most in any one day period during its history. As part of the 60th Battalion, Pte Silver was tasked with attacking the German strong-point known as the ‘Sugarloaf’ and like many of his mates including Pte Sheldrick of the 5th/22nd was struck down in No-Man’s Land under the withering German machine guns and artillery fire. Of the 887 officers and men from the 60th Battalion that went into the fight, only one officer and 106 men answered the roll call. Pte Silver was listed as Missing in Action and was not finally concluded as Killed in Action until the Court of Enquiry held on 4th August 1917. Pte Silver was never found therefore is commemorated on the V.C. 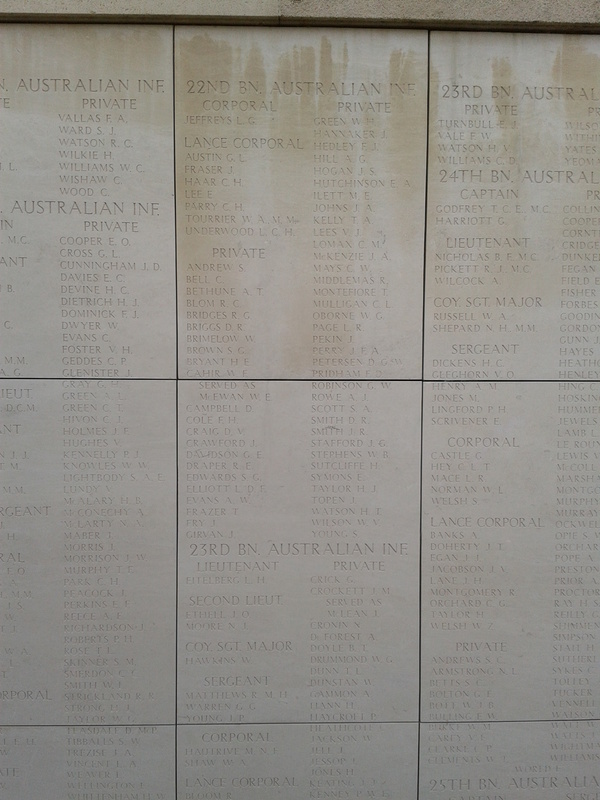 Corner Australian Memorial Wall close to where he fell and to the Fromelles Memorial Park. 30 year old Japanner Herbert Hosking from South Ballarat was one of the first of the 5th/22nd to enlist, joining the AIF on 3rd July 1915 before sailing with the 5th/22nd on the RMS Osterley on 29th September and for Egypt. Pte Hosking appears to have not had much luck during his relatively short time in the army. While in Egypt Pte Hosking was admitted to hospital twice, once with rheumatism and the second time with appendicitis. Upon arrival in France on 26th March 1916 Pte Hosking served with the 22nd Battalion in the Bois Grenier sector, and despite drink being an issue for the AIF in Egypt and France he was one of a few to face a Field General Court Martial for drunkenness, and was given a sentence of 14 days Field Punishment No.2. Sadly he was the first of the 5th/22nd to be killed when during a period of heavy bombardment while the 22nd Battalion was in the Firing Line he was killed in action along with 2339 Pte Hogan and two others from the Battalion. 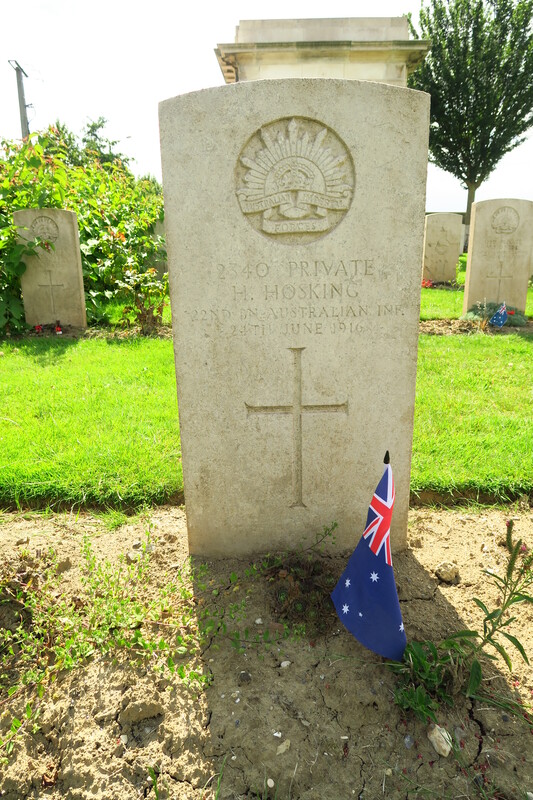 Pte Hosking is buried side-by-side with Pte Hogan and his mates from the 22nd Battalion in the Ration Farm Military Cemetery. 31 year old married Railway Porter from Brunswick East Maurice Hogan enlisted with the AIF on 5th July 1915 and sailed with the 5th/22nd on the RMS Osterley on 29th September for Egypt. Upon arrival in France on 26th March 1916 Pte Hogan served with the 22nd Battalion in the Bois Grenier sector, where during a period of heavy bombardment while the 22nd Battalion was in the Firing Line he was killed in action, along with 2340 Pte Hosking also of the 5th/22nd and two others from the Battalion. 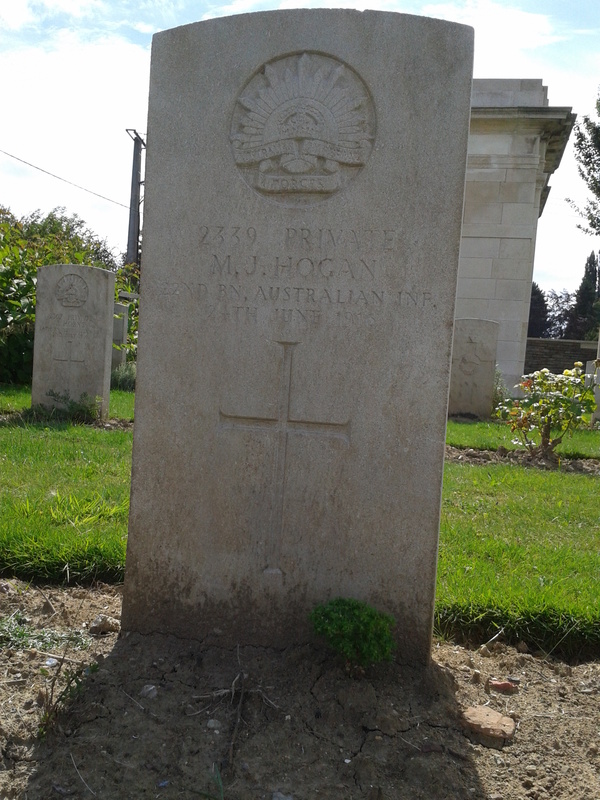 Pte Hogan is buried side-by-side with Pte Hosking and his mates from the 22nd Battalion in the Ration Farm Military Cemetery.